BANGI, 9 Dec 2013 – Malaysians’ love of food is their bane resulting in more than half being obese with many facing the possibility of getting heart-attacks, stroke, breathing problems and even risking cancer. That has also resulted in Malaysia having the most obese population in South East Asia. A Medical Officer at the Health Centre of The National University of Malaysia (UKM), Dr Arif Nasar bin Sulaiman said there are five categories of weight: normal, overweight, obese, severely obese and morbidly obese. For those seeking to lose weight, 95 percent of the challenge is their readiness to change their mind-set, perception and attitude towards how they view weight loss. Speaking at a talk in conjunction with a Health Awareness Campaign organised by the UKM Health Centre to promote healthy living, through eating right, exercise and living a healthy life-style. An exhibition on healthy lifestyle was held as part of the campaign while those attending had their body mass index checked. Dr Arif said more than half of Malaysians are in the severely obese category. The reason being that Malaysia is a prosperous nation with a thriving economy and plenty of food. While some nations are rich in land and architecture, Malaysia is rich in culture, history and food. There is joke where in Africa people die because there is a lack of food but in Malaysia people die because of too much food, he said. Seeing patients going through heart-attacks or stroke is most eye-opening with patients having to go through a very slow and painful process of recovery if they survive, Dr Arif said. The only solution, he said, is prevention by losing weight, doing exercises, making calorie counts and eating right which will ensure that a person is on the right path of a healthy and longer life. “This is a mind over matter issue and the body archives what the mind believes. So, you must believe that you can lose weight and that exercise and dieting will get you there,” Dr Arif said. Calories are energy that the body needs to carry out everyday tasks but if the body takes too much calories and does not burn it up, then it becomes fat. 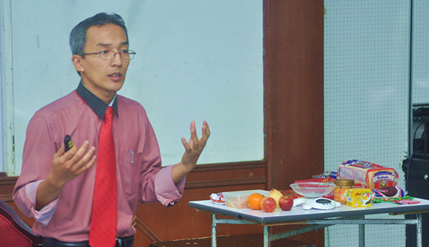 To lose weight, Dr Arif said, people should eat food that can satisfy hunger, low in calories and is full of nutrients. “In exercise, you have to start small, do it for 5 – 10 minutes a day. Then after some time, go for 30 minutes and instead of just basic exercises, go jogging. You can ride a bike or fast walking or go swimming, as long as you exercise, it still counts. You will see the difference. “Fitness is like a marriage, you can’t cheat on it and still expect it to work. So, be focused and have determination. It is not just about looking pretty but it’s about living longer and healthier,” Dr Arif said.